A six year era comes to an end today in Western Canada as it is the last day for the Club Sobeys program west of Ontario. Come tomorrow and Air Miles is the loyalty program of choice at Sobeys, Thrifty and of course Safeway which has been the Air Miles grocery store mainstay since 1992. For me unfortunately as someone who has chosen Aeroplan over Air Miles and shops at Sobeys out of convenience (only 1.5km from my house) I will definitely miss earning those Aeroplan miles. Over the past 6 years I have earned more than 80,000 Aeroplan miles for my grocery shopping and if you include what my wife has earned in her Aeroplan account and we were well above 120,000 miles in total. With the change to Air Miles I'm not sure if my shopping habits will change though. Sobeys is convenient which means I will probably boost my Air Miles account balance much faster than I do now (probably 10 miles per month right now!) but it won't make Air Miles my primary program. Don't get me wrong, Air Miles is still a great program for many Canadians for travel rewards but mainly other rewards. Last time I checked only about 10% of Air Miles redemptions were actually for flights while the other 90% was for merchandise, gift cards etc. I have redeemed for travel and merchandise when I had a much larger Air Miles balance and found the flight redemptions reasonable but with the recent increase mileage requirements I'm not too sure anymore. After a few months of earning Air Miles at Sobeys I'll report back and let you know what I think. At least I will still be able to use my Amex Gold Rewards Card on those purchases which ultimately translates to 2 Aeroplan Miles or 2 British Airways Executive Club Avios per dollar spent. What are you plans with this change over? Are you going to change your shopping habits or are you excited that you may be earning more Air Miles Rewards Miles now? We'd love to hear from you! 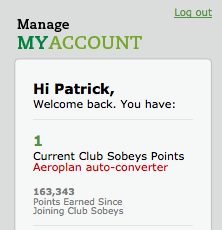 Comment below and feel free to let us know how many Aeroplan miles you earned in the six year Club Sobeys tenure! How do you end up getting 2 Aeroplan miles for a single AMEX point? Its not 2 AP Miles for one Amex point. Since the Amex Gold offers 2 points per dollar spent at Sobeys (and other grocery stores) that translates to the 2 Aeroplan Miles. Right, my mistake in reading what you wrote. Thanks! I too shopped at Sobeys to get many Aeroplan miles, but in my case, the store is a 20 minute drive from my house, with Safeways, Calgary Coop and Superstore in between. It would be silly for me to shop at Sobeys now, so they have lost a customer. I use points only for travel, and Airmiles is not that appealing anymore. No business class is the main drawback. But this fall, I looked at flying to France, and KLM flights required more Airmiles than other airlines: many more. This was not the case two years ago. KLM is my preferred trans- Atlantic carrier, so it made more sense to just buy the darn tickets. With airmiles, it would have cost the price of one ticket just for the fees for 2 people. By contrast, I have been to New Zealand 4 times in Business Class with the Aeroplan program. Not easy to use, but the best bang for your dollar by far.